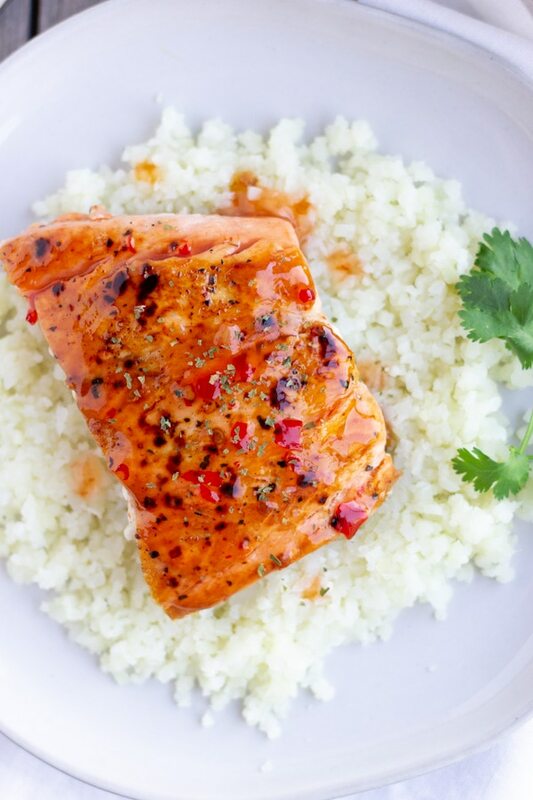 Two ingredients is all you need for a Thai Sweet Chili Salmon that’s easy to make for a healthy weeknight meal. I love easy recipes, especially ones that don’t need a lot of ingredients, and I can have on the table fast. 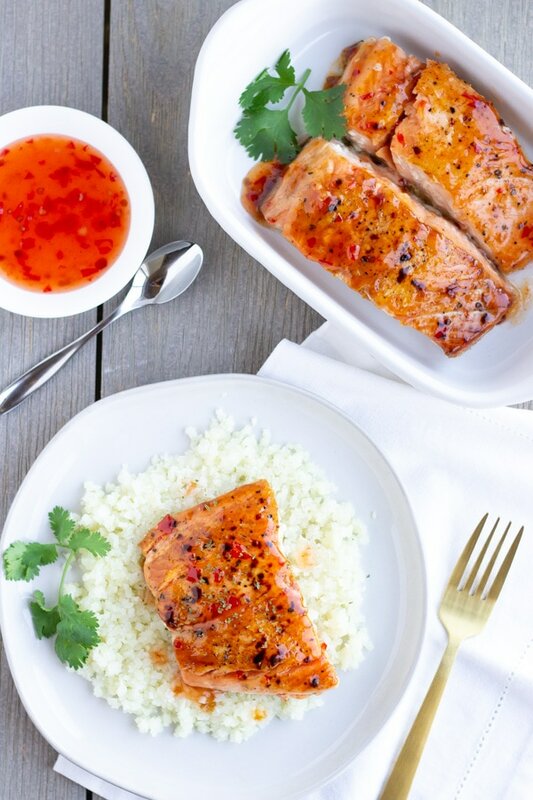 This Thai Sweet Chili Salmon is only 2 ingredients, the salmon and Thai sweet chili sauce. Of course you need some salt, pepper, and oil, but those are considered staples in any kitchen. There’s lots of health benefits to eating fish like salmon, and I always have some frozen on hand. My Costco rotation includes always having frozen fish, shrimp, chicken, and ground beef in my freezer. I’ve been using frozen fish for a while now. I would always buy fresh fish from the seafood counter, until I learned that most of the fish is just thawed, and not always as ‘fresh’ as they claim to be. With most frozen fish, it’s flash frozen right on the boat, so It’s actually fresh and you can defrost it when you’re ready to use. But if you do live near the ocean and have access to fresh caught fish, then by all means, take advantage! For the Thai Sweet Chili sauce, I prefer the one from Trader Joe’s or Thai Kitchen, since they both don’t use corn syrup. When cooking the salmon, the most important tip is to not overcook it! I start cooking the salmon with the skin side up to get a nice crust on the top of the fish, about 3-4 minutes, then flip it over to the skin side down, and cook for another 3-4 minutes. The heat should be just about medium. If its too hot you’ll start seeing white pockets oozing out, this is the fat coming out, which you don’t want to happen. Instead, get the pan hot with oil, and adjust the heat as needed once you put the fish in. 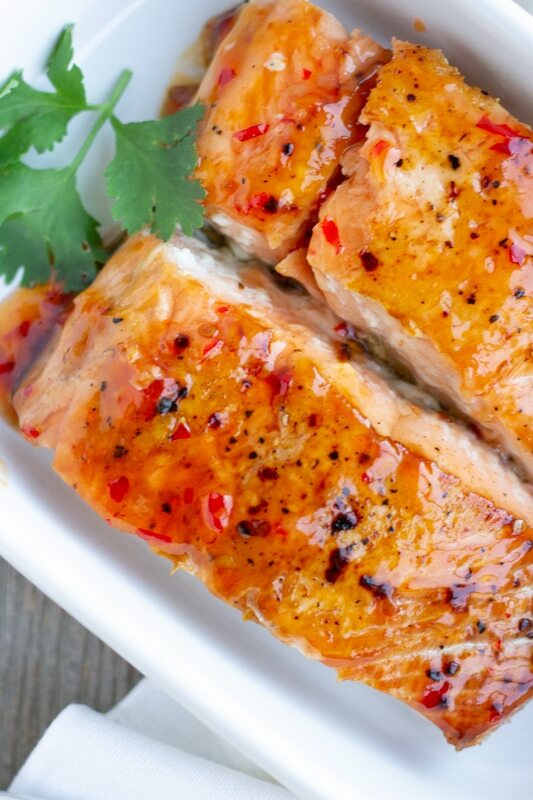 In the last minute of cooking I pour the sweet chili sauce over the salmon, allow it to bubble up, then remove and serve it immediately. This dish is pictured with cauliflower rice, but you could do, white or brown rice, quinoa, noodles, or zoodles for another healthy option. Heat a large non stick skillet over medium heat with oil. Season Salmon filets with salt and pepper on both sides. Place skin side up and cook for 3-4 minutes, depending on thickness. If fat pockets start coming out, then lower the heat. Flip Salmon over to skin side down and cook for another 3-4 minutes. On the last minute of cooking, pour sweet chili sauce over the tops of each filet. Allow to simmer for a minute, remove and serve immediately with either cauliflower rice (pictured), or white/brow rice, quinoa, noodles, or zoodles. Most important tip is to not overcook the salmon, You want just a slight bit of pinkness in the middle.